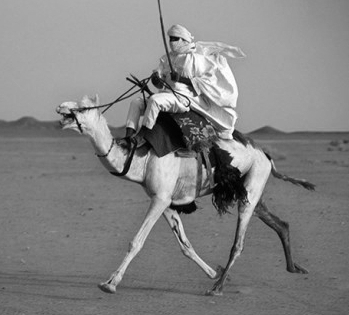 This saddle or "Tamzak" comes from the Tuareg, a nomadic tribe from Niger. It probably dates from the first half of the twentieth century. It has a wooden frame with a cross shaped front and a high back. This is covered in maroon coloured leather with incised and painted geometric decoration. The saddle would be placed on the front of the camel's hump, the rider would sit with legs crossed around the front and feet resting on the camel's neck. This was a genuine working saddle, the leather is scuffed around the points of the cross.